Garment Creation on Bhooked Podcast! Hey everyone! A few weeks ago I had the amazing opportunity to chat with my friend, Brittany from Bhooked, over on her podcast for a second time and, gosh, I am SO excited about it. Brittany and I took some time to talk about my creative process in garment making. Ever since I began designing crochet garments in 2016, I have fallen in love with it. I’ve found to have taught myself quite a bit from trial and error over the past couple of years and I’m excited to share some of these insights with you! In this episode we discuss so many fun things! From where I find my inspiration (and where I definitely don’t! ), how I go about creating a design and writing the pattern, and so much more! Brittany was such a wonderful host and asked some really awesome questions!! Be sure to take a listen to the full episode to hear our wonderful discussion! It’s a good one! You can listen to it here. You can access the episode on any of these platforms: iTunes, Stitcher, Google Play, TuneIn. I also wanted to take some time to write out some of these insights and suggestions as an additional resource for those interested! I know we all do things a little bit differently and no one way is the right way. Please understand that what may work for me, may not work for you - and that’s ok! There is freedom in art and each creative process may differ from one person to the next, but there’s such beauty in what these differences can achieve in their end results! I hope you can find some inspiration in how I do things! As many of you may know, I find SO much inspiration from yarn. The fiber content, the color, the texture, all of the above. Finding my inspiration for crochet designs is another favorite of mine, even though it has NOTHING to do with crochet.. I truly love to seek design elements from other mediums such as clothing I find at stores (ahem.. Nordstrom?! ), watercolor art, bridal gowns and other beautiful dresses with unique aspects, floral photography, weavings and so much more. It’s so incredibly important to me to do all I can to be original and to keep my designs 100% “me”. I feel like when we look to other crochet designs, those images don’t leave our brain and there is an increased chance that those designs and their elements will play a role in my “original” design, making it not original anymore. In a world where it’s hard to make an old craft new, it’s very easy to get caught up creating similar designs as other Makers because 1) the designs can be so inspiring and 2) it’s easy to change a few things of someone else’s design and call it “yours”, but I truly want to make sure I never step on toes and do my own creativity justice. Finding ways to gain inspiration outside of your chosen craft can be so rewarding as well as motivating. You really are creating something NEW! Ok, now I have my inspiration and some ideas on what styles of things I like. Now what? 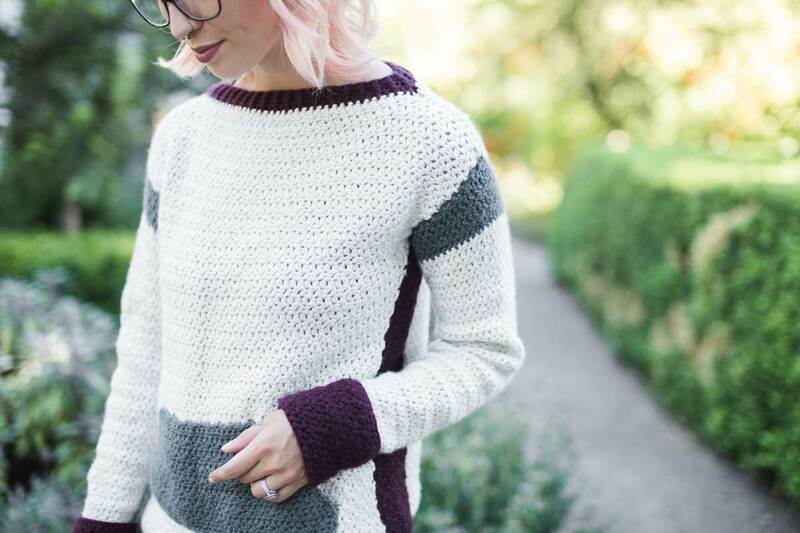 I know many designers like to sketch out their ideas, create swatches, and basically plan out the whole design before they even pick up their yarn and hook/needles. For me, I suppose I work a bit backwards.. When I am feeling an itch to begin a new design, I first look for yarn that is “calling” to me. Choosing a yarn that I am going to have fun working with and THEN figuring out what to make with it is so much fun for me. Just think about it, as Makers, we spend HOURS working on our projects and when we choose yarn or materials that “gets the job done” and just look to the end result when we finish our piece, we are missing so much of our Maker experience! We don’t make things just to be done with them, we make because we love to! By using materials that excite us, it allows for the entire creative process to be inspiring and fill our creative soul. Spend those countless hours of creating with materials that make the hours enjoyable. Don’t take the process for granted. Remember why you started in the first place: because making things with your hands makes your heart happy. Instead of beginning with a proper and calculated swatch sample like most professional designers, I just pick up the yarn, attach it to my hook and begin chaining. I am probably the most unprofessional ‘professional’ in the community, but that’s ok for me. I love being able to just GO, to just let my creativity have the freedom to become whatever it wants to be. I’ve tried planning designs by sketching, swatching, etc, but realized that it’s all just a waste of time for me. I’m pretty sure I have NEVER completed a project how I first planned it to be. Going rogue in the middle of my designs is a common practice over here. 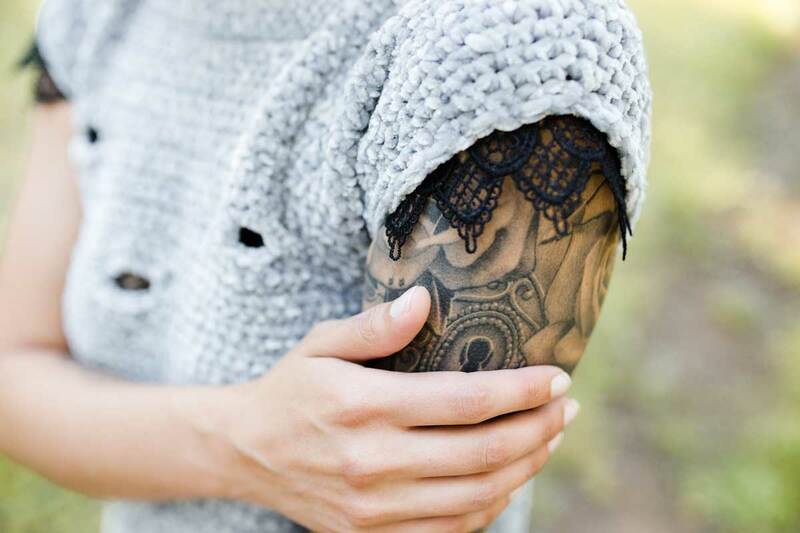 I love how I can imagine a sleeve to look a certain way, but as I get the body worked up, I think about an even better idea and do that instead. And then while I’m working on that new sleeve design, I realize the cuff would actually be better if I did it this way, so I change my idea yet again. I have so much fun giving myself freedom to do things in a way that makes sense for me. Whether planning and prepping or going rogue works for you, find confidence in it. Your creative process should be perfect for you and just because someone else does it another way, it doesn’t mean it’s the “better” way. When I say I write the pattern as I make the sample, I mean it literally. I keep an easy and basic pattern template on my desktop and as I work up each row/round, I write it down in the template. Yes, it takes a bit more to keep my computer handy while I work, but it makes it so much easier by the time I’m finished. After I complete my sample, I go through and edit anything that needs to be edited, input the needed materials, abbreviation key, notes, etc and then send it along to the tech editor! Boom. I really should do this every time, but that’s always easier said than done. Ha! -Description of design - I try to add a little bit of personality here! …did you catch the sizing information notation? Yeahhh… Let’s talk about that. Sizing (or grading) your garment patterns can be a real source of frustration and it’s something I kind of really despise, ha! I mean, I’m not sure why no one told me how important MATH was when it came to crochet. Why does life have to be so cruel?! Creating additional sizes from your sample can be easy or difficult or anything in between. I am NOT someone who thrives with numbers so I choose to work smarter, not harder, in these cases. Knowing that I am probably going to hate life if I have to figure these things out, I seek out help from people that WON’T hate life to do it. Yes, you heard me right. There are people in this world who don’t actually hate math.. I’m not sure what kind of sick joke it is, but I’m grateful for these number-loving individuals. But, again, finding those unicorns who can help with sizing can make this whole process a little less terrible. In addition, I have discovered the importance of tech editing. I found this really well explained blog post explaining the difference between test knitters/crocheters and tech editors. Check it out here! And just for the record, I highly encourage everyone to have their patterns tech edited AND tested. Why not invest in your work at such a high level and do everything within your power to provide the best versions of your patterns, even if it costs money? Do your work justice and give it the nourishment it deserves. But seriously, I highly suggest not even thinking of releasing your pattern without AT LEAST having it tested or tech edited, but ideally both. Be responsible. Even the most experienced and skillful designer can make errors, we are all human! Another aspect of pattern writing is photography. Have you ever been scrolling through Etsy, Ravelry or any of your other favorite platforms to find new patterns and come across a photo with such beautiful imagery, excellent lighting and editing, and really focuses in on the beauty of the project? It makes you want to make it, right? We want to strive for that, we want our audiences to see our hard work showcased so beautifully. Think about it, you are spending hours upon hours to create this amazing and original project sample. You spend hours writing the pattern, editing, testing, and even tech editing the pattern. You put so much time and effort into one little PDF file, why not go the extra mile and feature your work in the most intentional way possible? You’re proud of your work, let your photography prove that. Whether you choose to practice photography on your own, or work with a friend who knows a little bit about editing photos, or even hire a professional. I promise, photography can be the make or break option in having your pattern/project/etc be so insanely successful. When including photos in your patterns, it’s always really important that you show photos that demonstrate how to do tricky stitches, assembly, WIP, as well as final shots of the piece on the body. Everyone wants to see how it fits, how it lays against the body. You can include close up shots of the stitch work and texture of the fiber. These are beautiful ways to share with others what the final design will look like. At the end of the day, sometimes we spend all of this time, energy, money and sacrifice into these designs (I mean, do you know how much that yarn cost?! ), all to have it go wonky and not turn out how we anticipated. Failures, man.. They’re so real. And you’re NOT the only one with a 3/4 made project that just looks like garbage.. We’ve all been there, and that’s ok. From gauge issues to sizing frustrations to math resentments.. Sometimes we can do all we can to create something beautiful just to have it be for nothing. However, I don’t want you to view it as a ruin. To experience failures only allows for the successes to be that much more rewarding. So, in conclusion, no matter how you go about designing and creating your next project, just know that however it works for you, is how you should do it. Yes, there are responsible requirements you should consider, but in terms of the creative process and the joy in your hours creating this content, this is all up to you. No one way is the right way, all that matters is that you enjoy your time with your yarn and that you love what you’re making. Make your time spent so incredibly delightful. You deserve that. Want to hear my first episode I had on the Bhooked podcast? Check it out here! Also, want to meet both Brittany from Bhooked and I and hear more from us? Be sure to snag your ticket to the Our Maker Life event in Chicago, Illinois coming this July! Tickets are selling quick so be sure to get yours here!! Hope to see you there!